And of course a week with awesome science-y space news is not complete without a little bit of xkcd. So New Horizons is long since gone from Pluto. But it will still take 16 months to send back all the photographs and science. Why so long? Because so far away. 3 billion miles away. Put another way, light from the sun takes eight minutes to reach Earth as it travels at, well, the speed of light. Radio signals that travel at the speed of light take 4.5 hours to reach Earth from Pluto. So imagine trying to send large data files that far away at a download speed less than that of a 56k modem, for those of you old enough to remember such a thing. But what receives these radio signals? NASA’s Deep Space Network of antennae that allow NASA to communicate with spacecraft and such things that are in, wait for it, deep space. These antennae are scattered throughout the world, but in this screenshot taken Monday, you can see just what the antennae at the various complexes are doing. Here, we see New Horizons (NHPC) just prior to its flypast communicating with the large antenna at the Madrid complex. 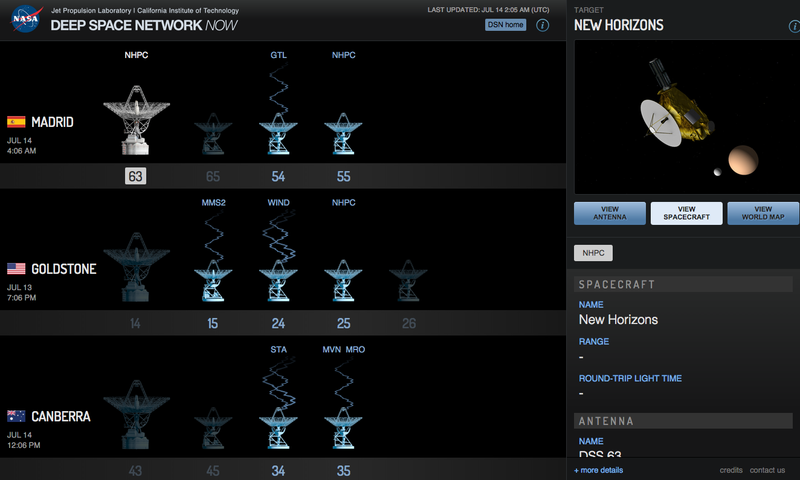 The lack of signal lines indicates that it is preparing to setup, takedown, or is tracking the spacecraft. 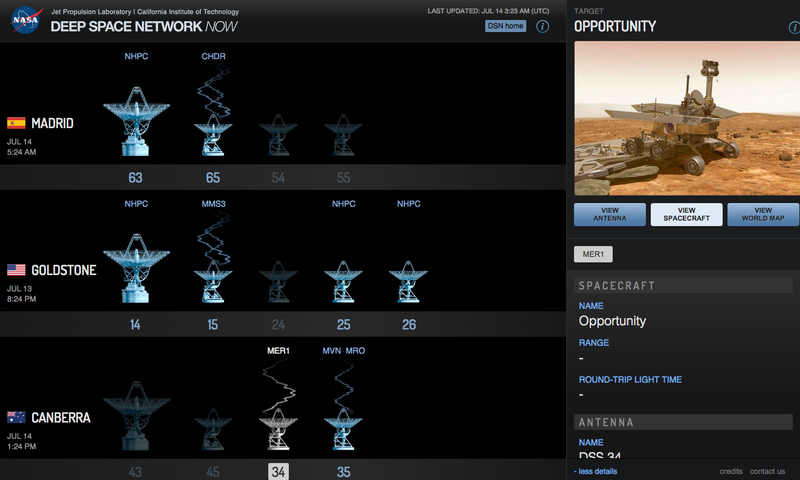 As a fun aside, I left the tab open in the browser and a few hours later came back to find the Deep Space Network sending signals to the Mars rover Opportunity (MER1), the Chandra X-Ray Observatory (CHDR), and the Mars Reconnaissance Orbiter (MRO) amongst others. Credit for the piece goes to the NASA graphics department. 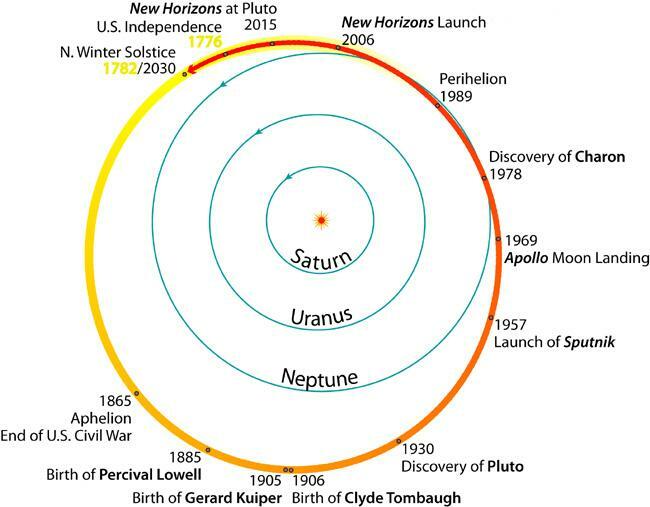 A little after 07.30 EDT, New Horizons began its race past Pluto, what your author grew up learning as the ninth planet in the Solar System—the last planet to be explored. I recall thinking that when it launched back in 2006 I had no idea what I would be doing nine years later. Or at least I think I thought that. It launched nine years ago, almost a third of my life. 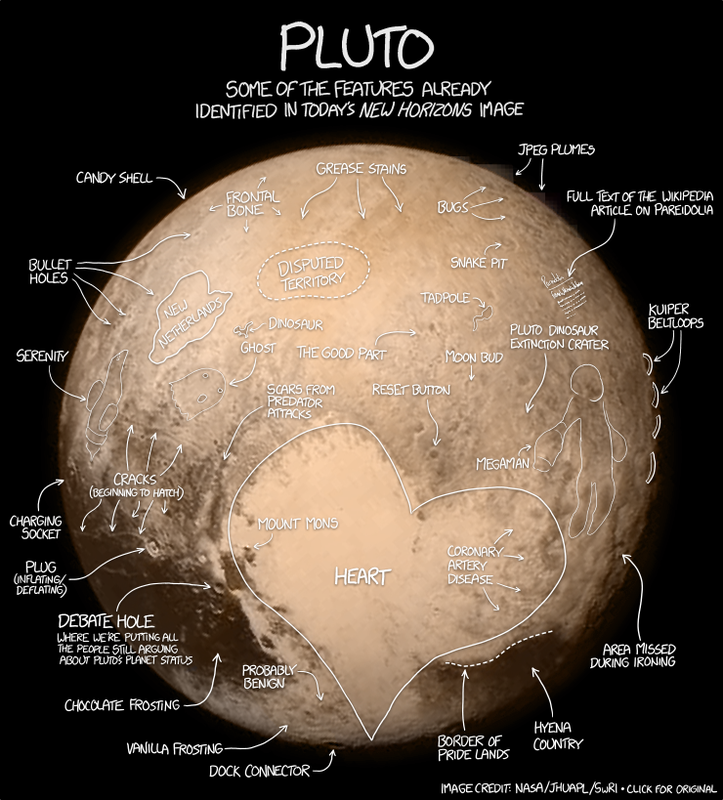 Regardless, I was definitely one of those upset with the decision to downgrade Pluto from planet to dwarf planet. Anyway, a decade on, there New Horizons is. By the time this post goes live, she will be barreling away towards the Kuiper Belt while transmitting her photographs and science data. This piece from the New York Times looks at what happened earlier today in, for Americans, the wee hours of the morning. So this is generally a more serious post than usual for a Friday. Because, it is about New Horizons, the probe we launched almost a decade ago to explore Pluto, which at that point was still technically a planet. Anyway, the Washington Post has a nice illustration detailing the various sensors and orbits and trajectories. But what gets it a Friday post? Its sense of scale. Credit for the piece goes to Richard Johnson. Last week, NASA’s Dawn probe entered orbit above Ceres, a dwarf planet in the asteroid belt. 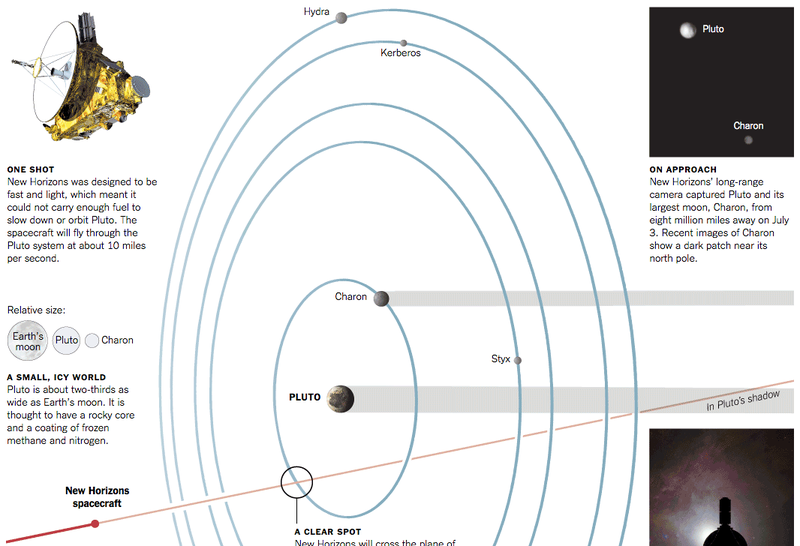 But later this summer, the New Horizons spacecraft is set to race past Pluto, formerly a planet but now a dwarf planet. New Horizons launched in 2006 and will have taken nine years to reach Pluto. But how long is a year on Pluto? 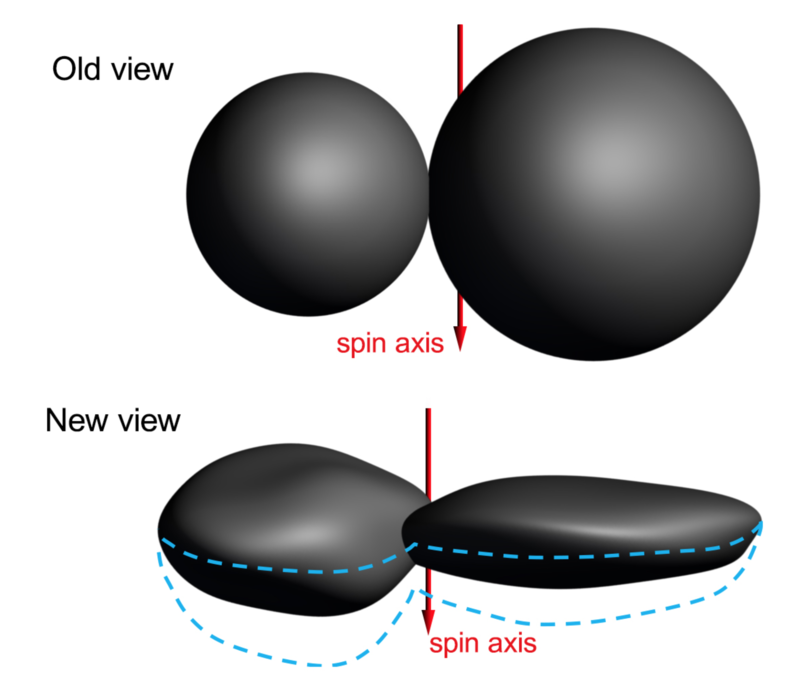 Thanks to the New Horizons team, we can see how one year on Pluto is 248 Earth years, or longer than the history of the independent United States. 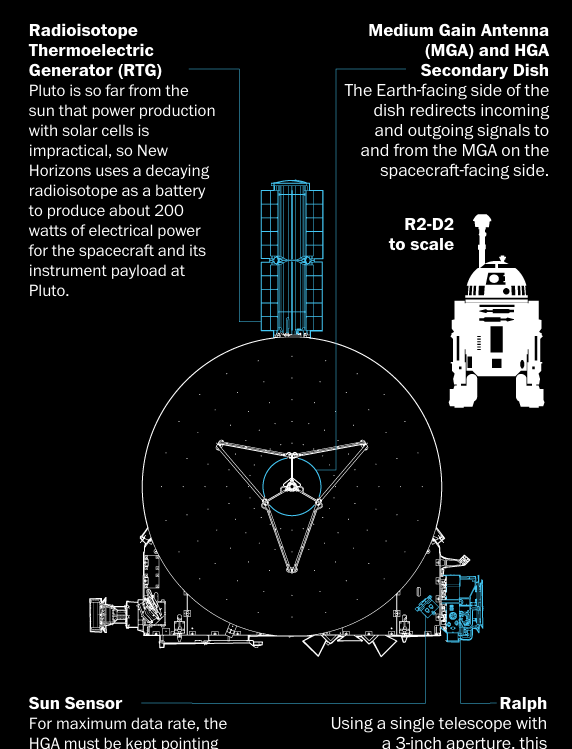 Credit for the piece goes to the NASA/New Horizon team graphics department.